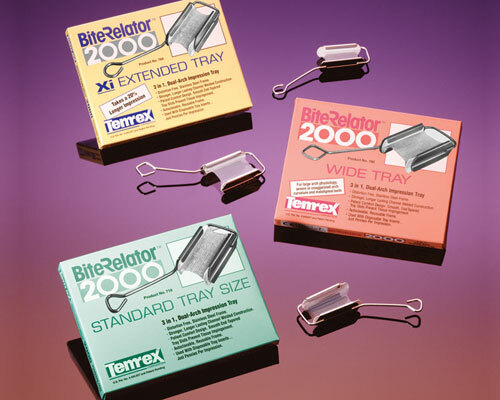 Temrex Bite Relator 2000 Dual-Arch Impression Tray Temrex’s Bite Relator 2000 is a 3-in-1 dual-arch, stainless steel posterior quadrant impression tray that is designed to ensure accurate, distortion-free impressions. An evaluator who has been using his current impression tray for more than 3 years said, “I was very impressed with this product and will definitely use it in the future.” Another evaluator said, “The tray is good for small quadrants. The reusable feature is good, however, I often cannot get enough teeth to properly set the bite.” The evaluators’ consensus on Temrex’s Bite Relator 2000 is that it features a combination of reusability and convenience, and with a few more sizing options, could be even better. Considering the primary purpose of the product is to provide distortion-free impressions, and that it scored highest in this category (4.1), the Bite Relator 2000 offers a solid experience. Temrex designed the Bite Relator 2000 as a fast and convenient solution for taking posterior impressions. It takes 3 impressions simultaneously—the occlusal relationship, the prepared teeth, and the opposing dentition—all the information the dentist needs to fabricate restorations accurately and easily. Dental Product Shopper recruited 14 dentists with an average of 23 years of experience in dentistry to evaluate the Bite Relator 2000 and comment on its features.